Raising the profile of the role of caring in the national, regional and local media and encouraging groups and organisations to take part and organise events and activities. Helping the public identify themselves as carers and access the support, advice and information they need. 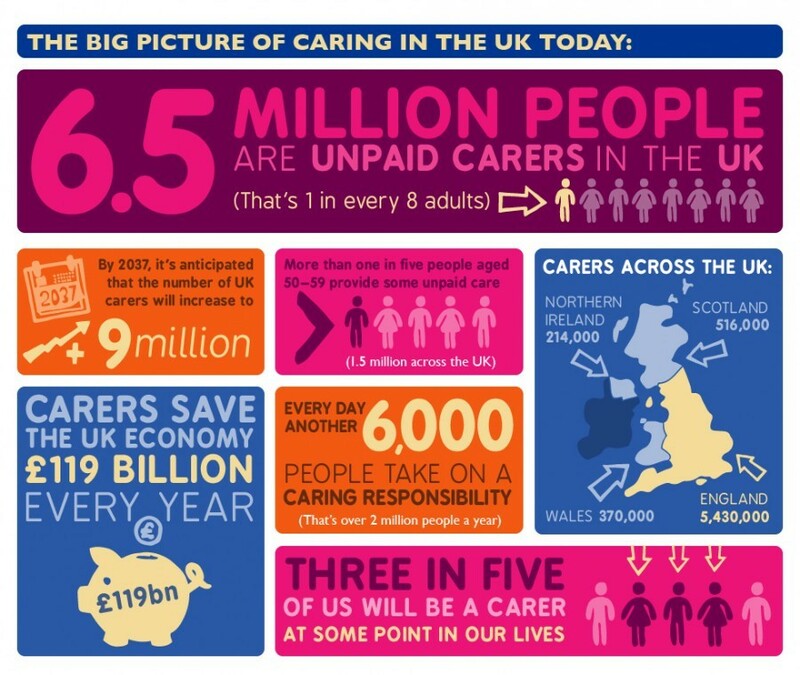 Celebrating and recognise the contribution the UK’s 6.5 million carers make to the people they care for and their communities. Highlighting the challenges of caring and campaigning for sustainable funding for services and support for carers and the people they care for. Raise awareness about the contribution carers make to society. Engage with people at my workplace to enable individuals to identify themselves as carers. Signpost individuals to information and support. Having recently finished a research project which shows a relationship between carers’ quality of life and easy access to helpful information, I decided to set up an ‘information station’ at a different campus restaurant each day. On day 1, I set up my stand in the corridor outside the first restaurant which was excellent for passing footfall. There was considerable general interest and a few people stopped to chat and took some leaflets. However, the time constraints often faced by carers, were clearly demonstrated when a woman sprinted past, grabbed a leaflet and shouted thank you as she disappeared down the corridor. It was a pattern set to continue. The second day was little quieter, mainly because many students have already gone home for the summer vacation. The students that did stop to chat were quick to see how unpaid carers contribute to society and the wider economy and happily went off wearing their Carers Week stickers. A staff member who had heard about the ‘information station’ but was too busy to come along had asked the restaurant manager to collect some literature on her behalf. Perhaps, I had been mistaken to assume that carers would have time for a lunch break. Another chat with a staff member was interrupted half way through as she had popped in while on duty. When our conversation was later resumed, I learned that she works full-time in addition to her caring role and therefore, is familiar with balancing completing demands. She chooses to continue to work full-time as it helps her to maintain a life for herself outside of her caring role. Day 3 was by far the busiest, the stand was set up from 10.00am, maximising opportunities for raising general awareness with the striking posters and infographics provided by Carers UK. 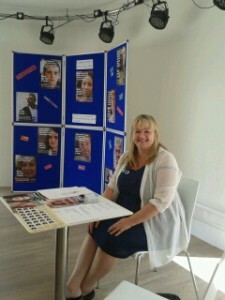 The early set up and pre-advertisement of the lunchtime session meant more carers stopped by than on previous days. Three of them were ex-carers. The space left behind when a loved one passes away can be hard to fill, especially for those who put their own lives on hold to care for them. The opportunity to talk about their past experiences of caring was welcomed. I’d been told not to harass the diners. Being a carer can be a very private thing, especially in some cultures where taboos surround ill-health. I knew that some people may be reluctant to identify themselves as a carer, particularly in a workplace setting, so I wanted just to ‘be there’ discretely, available to help if it was required. Reflecting on the week’s activities, to what extent did I fulfil my pledge? Please comment below. Diane Fox is a Research Officer at the Personal Social Services Research Unit at the University of Kent.